The iPod Touch 4 debuted with the Retina Display and 720p video recording and playback capabilities. The iTouch 4 is like an iPhone without the phone, GPS, and 5mp camera. If you are a Mac user who are using the latest iPod Touch 4 device, you may want to enjoy 1080P or 1080i HD MKV/MTS/M2TS/EVO/AVI, etc videos on your iPod Touch 4 with 720p HD resolution freely. So if you get an iPod Touch 4G, you will be so lucky to watch movies up to HD 720p everywhere. In order to help you make full use of your iPod Touch 4G HD 720p movie playing function. Aunsoft iPod Touch HD Video Converter is designed to give you more choice to enjoy kinds of movies. It supports to convert HD 1080p/1080i videos to HD 720p MP4 for iPod Touch 4G, including but not limited to 1080P or 1080i HD MKV, MTS, M2TS, EVO, HD AVI, HD MPG, TS, etc. Have a look at the steps below to convert 1080p/1080i videos like HD MKV/MTS/M2TS/EVO/AVI to iTouch 4, and output movies up to HD 720p resolution. Step 1. 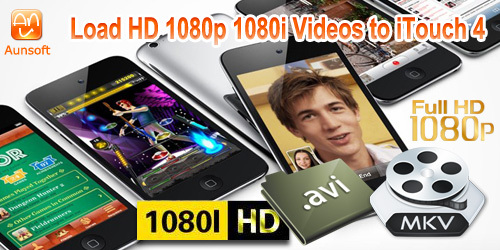 Load HD 1080p, HD 1080i videos to Aunsoft iPod Touch HD Video Converter. Run Aunsoft Video Converter as the perfect HD Video Clips to iTouch 4 Converter, and click the "Add" button to load HD videos in formats like MKV, MTS, M2TS, EVO, HD AVI, MPG, TS,. Step 2. Choose 720P HD MP4 format for iTouch 4G. Click the "Format" option and choose iPod > iPod Touch 2 H.264 (*.mp4) as output format for iPod Touch 4G. (Want to get 720p HD MP4 format, please click “Settings” to customize the Size to 1280*720 by yourself, you can also set the video bitrate higher like 1500kbps, 2000kbps). Step 3. Convert HD 1080p/1080i videos to 720p MP4 for iPod Touch 4G. Click the convert button under the preview window, and the conversion from HD MKV/M2TS/EVO/AVI to iPod Touch 4G 720p MP4 starts immediately. After conversion, just transfer your converted HD 720P MP4 to iTunes and then sync to your fancy new iPod Touch 4G for enjoyment.